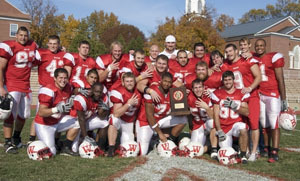 The Wabash football team was picked by the media and coaches to finish no better than second in the final league season standings at the 2008 Media Day. A new head coach and staff, a new offensive and defensive system, and the loss of a talented receiving corps and an All-American linebacker kept many outside the program wondering if the Little Giants could compete for an NCAC title. Fast-forward five months and Wabash is ready to celebrate another successful season on the gridiron. Twenty-three senior members of the Little Giant football team (left) helped guide the program to a record of 40-7 during their time at Wabash, more victories than any other group of seniors has produced. They can boast four consecutive conference titles and three trips to the NCAA Division III football playoffs, including back-to-back appearances for the first time in school history. For three seasons this dedicated group of seniors worked with head football coach Chris Creighton and his staff. Then, when Creighton announced his plans to leave for Drake University in December 2007, they embraced Coach Erik Raeburn and the new coaches and ideas he brought from Coe and Mount Union. There would be little time to easy into new offensive and defensive schemes before starting NCAC play. The Little Giants opened the season at Denison in a league game. Only two senior receivers --- Andrew Rode and Brock Graham --- entered the game with any real varsity collegiate experience. Sophomores Kody LeMond and Wes Chamblee grew up in a hurry against Denison, combining for 14 catches for 216 yards and three TDs. LeMond’s second touchdown catch would prove to be one of the most memorable events of the year when he made a diving grab in the end zone on a tipped pass at the end of the first half to give Wabash a 21-13 lead. The Little Giants would roll up 391 passing yards and 501 yards of total offense on the way to a 41-27 win over the Big Red to start the drive toward an eventual 7-0 NCAC record for the third time in four years. The win over Denison was the start of a special season for junior quarterback Matt Hudson. He would go on to earn the NCAC Offensive Player of the Year Award while leading the league in passing yardage, total offense, and passing efficiency. He became the second Wabash player to throw for more than 3,000 yards in season, completing 227-of-354 passes for 3,135 yards and 29 touchdowns. LeMond became one of Hudson’s favorite targets, setting Wabash and NCAC records for receiving yards with 73 catches for 1,228 yards and 14 TDs. His four-TD effort against Kenyon included a 70-yard catch-and-run from Hudson for the longest play from scrimmage for the season. Seniors Brock Graham (right) and Andrew Rode added 29 and 21 catches and a total of 598 yards and seven TDs. Chamblee was second on the receptions list with 34 for 495 yards. He found the endzone twice on two huge plays. His 91-yard kickoff return to open the game at Hiram effectively put the game away early on the way to a 63-0 win over the Terriers. However his two catches against Case Western Reserve in the first round of the NCAA tournament are the plays that will always be remembered. Chamblee hauled in a 21-yard pass on 4-and-15 in the closing minute of that game with the Little Giant trailing Case by four points. The very next play saw him race to the endzone for the game-winning score on a 52-yard reception to send Wabash to the second round with a 20-17 victory over the Spartans. While the Wabash offense proved to be dangerous through the air, the rushing attack added another dimension for opposing defenses to consider. The quartet of Bobby Kimp, Adam Pilli, Evan Sobecki, and Derrick Yoder combined for 2,075 yards and a school-record 33 rushing touchdowns. The foursome ran for 18 touchdowns in a three-week period, including five against second-place Wooster in the showdown for the conference title on October 25. Kimp led the ground game for the Little Giants with a career-best 617 yards and nine TDs on 124 carries. Sobecki battled back from an ankle injury to record 91 carries for 498 yards and eight scores. Yoder saw his first real action in the backfield for Wabash, responding with 478 yards and seven TDs. Pilli closed out his career with 309 yards and four scores, adding the longest run of the season for the Little Giants with a 60-yard carry at Hiram. The offense continued to post impressive numbers, but it was matched by the equally-notable numbers from the defense. Wabash ranked in the top-30 in the nation in scoring offense (39.42 ppg), total offense (436.92 ypg), passing offense (264 ypg), rushing defense (88.67 ypg), and total defense (274 ypg). Leading the way defensively for the Little Giants was junior Bryan Watson. 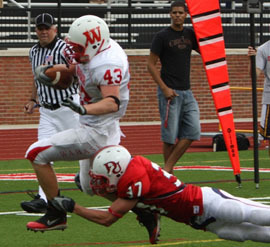 Stepping into the middle linebacker spot vacated by the graduation of All-American and two-time NCAC Defensive Player of the Year Adi Pynenberg, Watson topped the charts for Wabash with 70 tackles (37 solo, 33 assists). Seniors Rich Lehmann, Jared Lange, and Darryl Kennon (left) banded together to make 37-1/2 tackles for losses and 14-1/2 sacks. Lange led the team with 7-1/2 sacks and 16 tackles for losses. 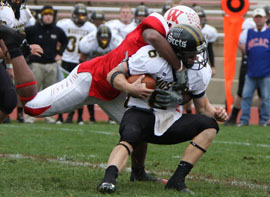 Kennon would make his final season at Wabash a special one, setting the school record for sacks with 30 after recording six for the year on the way to adding his name to the NCAC Defensive Player of the Year Award. He and Lange climbed the career tackles for loss list together, finishing fourth (56-1/2) and third (57.5) respectively. Special teams proved to be a positive for Wabash, as well. Two years after a missed field goal ended the hopes of an undefeated conference season with a 19-17 loss at Wittenberg, Spencer Whitehead (right) drilled a 41-yard kick to send the Tigers to a 13-10 loss while keeping the Little Giants in line for the league title. Chamblee’s 91-yard kickoff return at Hiram was one of many big plays for the sophomore. He averaged 27.83 yards per kick return, 17th-best in the nation. Senior Drew Oehler ended his career with 53 made extra points while sharing those duties with Whitehead. 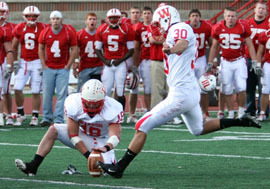 Oehler’s 53 PATs place him seventh on the Wabash career list. The season had its disappointments too. The Little Giants lost to DePauw in the Monon Bell game and saw their season end after falling to Wheaton at home in the second round of the playoffs. All things considered, however, Wabash football fans will remember this 2008 season and these Little Giants for many years to come.